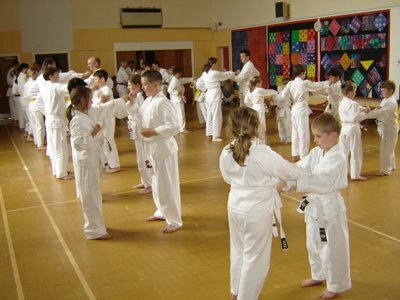 Over last weekend Rebecca and myself went to train with Uwe Sensei in Nottingham. 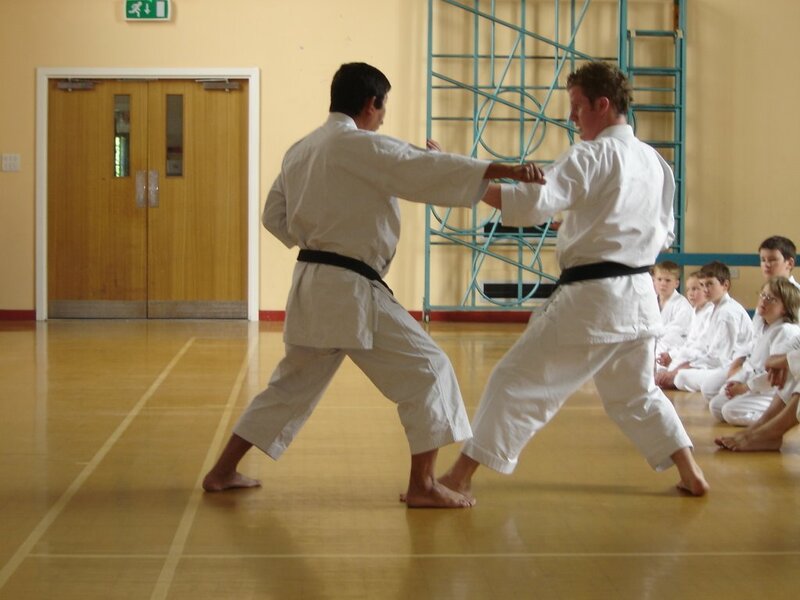 The course was hosted by Alan Campbell Sensei chairman of JKS (GB) and Ireland. 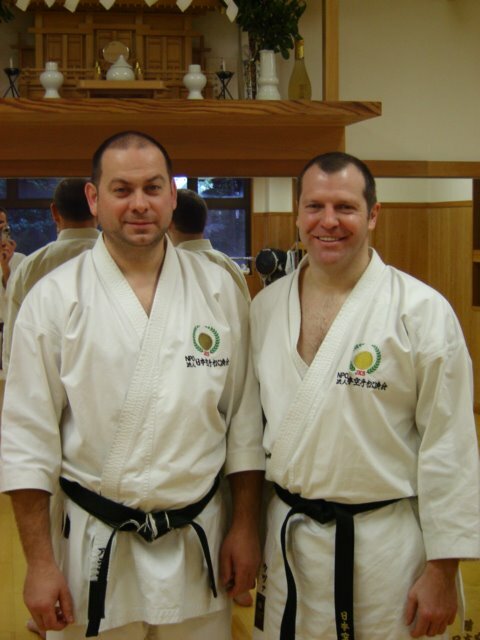 Uwe Sensei is technical director for the JKS in Germany and has been German champion 15 times in kata and kumite. Uwe Sensei course was based on movement and weight transfer. Moving in and out of distance and moving and attacking on the open and blind sides. 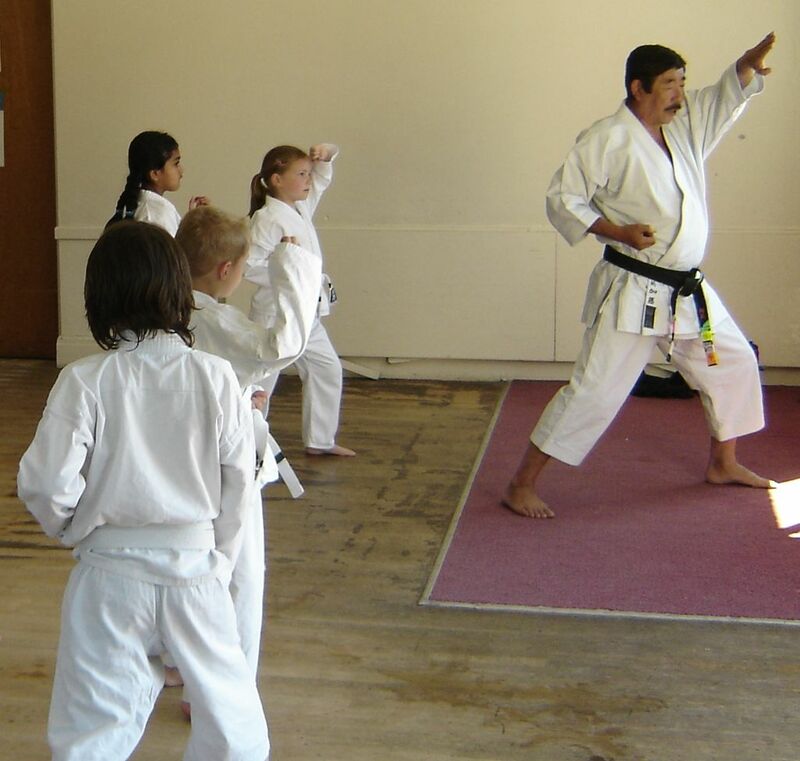 Alan Sensei also did 30 minutes or so on close quarter defense and counters. Rebecca was a little apprehensive about training with another association, but as always Alan Sensei and his karateka made us very welcome. It was a little disappointing that the course was not better supported (perhaps due to temperatures being in the high twenties). I would encourage all karateka to travel and train with our extended karate family, while remaining loyal to your own Sensei and association. Uwe Sensei, many thanks for a great course! I will be putting into practice some of your training shortly, just need a few more hours practice first. Another great course and grading with Kato Shihan, we are honored that Sensei comes to York so frequently, despite a very busy International schedule. 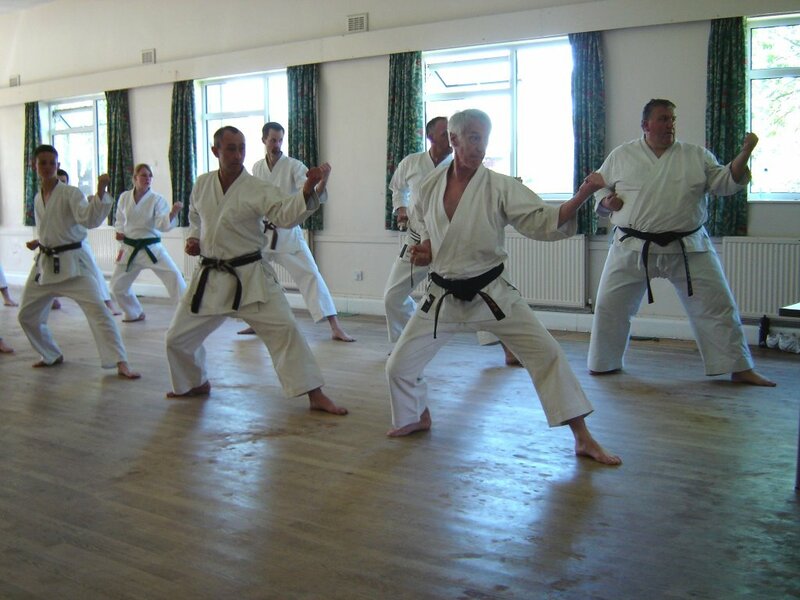 Sensei's focus was on Kihon and Shotokan Kata, Most of the weekend was developing sound knowledge of the basics within the Heian Katas. The head moving first, identifying the target then "Action!" Sensei focused on the intermediate marker as being a strong technique and the same effort should be placed on it as the execution of the full move. Sensei goes through Heian Shodan with the white belts. I don't think they were all following at the same pace, some were obviously having a little difficulty with Senseis accent. On the Sunday we moved to Strensell to train and for a few members to grade. I would like to think that I know Heian Shodan as a 1st Kyu, but I definitely did not want to swap places with Sensei Ash as Sensei attacks. 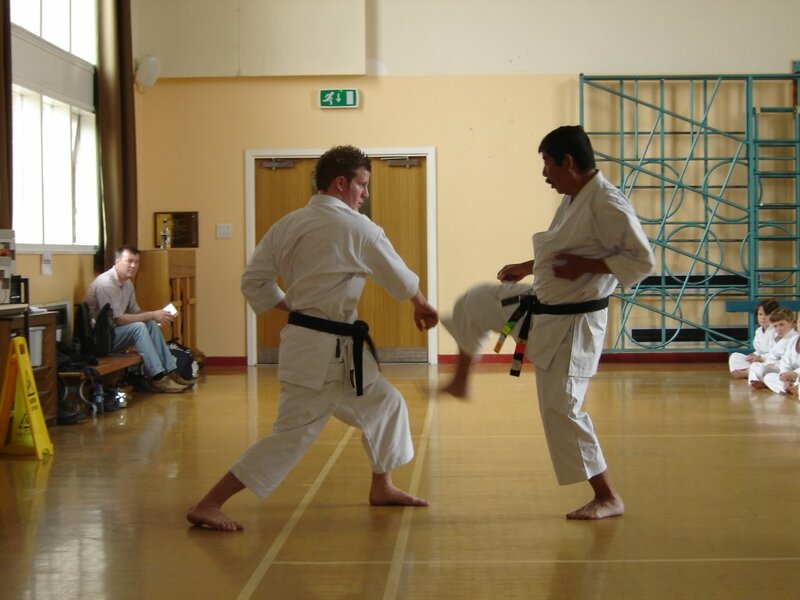 Ash blocks Shuto uke as an intermediate move before stepping in and striking Shuto uke Jodan. There is not a lot of thinking time when Sensei calls you up for assistance. After training fro six years now I still can not relax...much to the frustration of my instructors. When you watch Sensei every technique appears to be totally effortless.. Pom..Pom..Pom.. When I first attended Sensei courses I came away only being able to remember about 5% of what he had showed us. It does get better, perhaps the brain has relaxed a little to take more information in even if the body is sadly lacking behind. We also did some close quartered blocks and counters that I would describe as a short Suzuki uke followed by a gyaku zuki ( I may be wrong though) . Sensei took some delight in the count getting faster and faster. Once tired with no choice to relax it did become a lot easier, almost on auto pilot. 34 students graded in al, a few achieved a temporary grade and the majority a full grade. 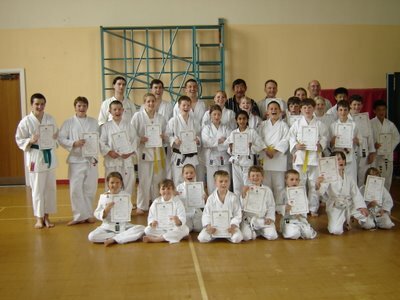 Below is Sensei with the majority of the students that graded. Special congratulations to Helen ( just in front of Sensei) still recovering from her car crash and not fully fit, graded and passed 1st Kyu!